These two shots were taken on the garden beside my former office in Libis where the owner lend the place to a family and they built a wonderful garden of vegetable and flower plants. I even bought some plants for my Mom. I missed the place because it's the first thing that I get to see before reaching our building and these beautiful Española flowers (am I right?) were the ones near the road. I have to brave myself before the family's watchdog before I had these shots! Anyway they held the dogs while I take the shots but I'm really not comfortable if they're not tied lol! It's my granny's favorite flowers and we used to put some of these kinds in her grave when I was young. 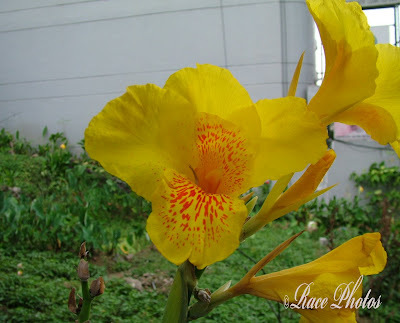 Thank you for sharing your beautiful flower pictures. I believe they are Canna flowers? 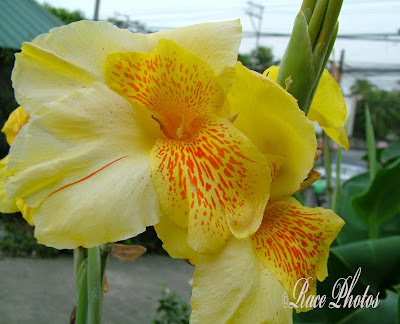 Hi Race, this is a stunning flower and I can understand why it is one of your granny's favorites. What a beutiful and sunny flower! Thank you for sharing this with us!